Big stars explode and little stars last forever, but medium stars like our sun just fade away ... or do they? Astronomers once considered the death of middling-size stars like our sun almost too boring to bother with. Not that they don’t have some drama--our sun, before it goes, will turn what’s left of Earth to a charred husk. It’s just that larger, very massive stars die in such a spectacular fashion: they flare up, and out, as supernovas, spewing 10 to 100 times the mass of our sun in all directions. So it’s not surprising, then, that for many years they completely stole the observational spotlight. Two decades ago, however, improvements in telescopes and computer simulations began to give astronomers their first detailed understanding of what actually happens when smaller stars die. And last year, when astronomers trained the Hubble Space Telescope on some of these dying stars, the images they got back revealed a process that was far more complex and subtle than anyone had imagined. As it turned out, the stellar demise was anything but a comparatively dull fading into oblivion. 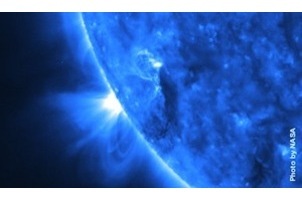 These images were a real surprise, says Howard Bond of the Space Telescope Science Institute in Baltimore. You figure that you’re looking at just a glowing cloud of gas that would be fuzzy even with the Hubble. But there are all sorts of sharp features that no one expected. A star begins to die when the last of the hydrogen fuel at its center succumbs to the star’s fusion furnace and the center collapses into a highly compressed, white-hot core. With the contraction, the core’s temperature rises. The heat becomes so intense that helium, a fusion by- product, begins to burn both within the core and just outside it, along with hydrogen remaining outside the core. Effects of this heat are felt all the way out to the star’s outer layers, which begin to expand, ballooning the star into a monstrously swollen red giant. The outermost layers of the star are now slowly cast off in a phenomenon known as stellar wind, until, eventually, comparatively little gas is left around the core. This remaining gas is heated rapidly and pushed outward at very high speed. Soon it collides with the slower, cooler gas ahead of it, piling it up into a bright, dense cloud called a planetary nebula. In a brief 10,000 years or so the core, now left in the middle of a vast cloud of dust and gas, finally begins to cool and fade. For the observer, combing these remains for clues to the star’s last millennia is like peeling onion skins, says Bond. If you work your way in from the outside to the star’s center, you’re retracing the process by which the star ejected its outer layers. Astronomers were thrilled when they first saw the Hubble images of the planetary nebulas ngc 7027 and crl 2688, also known as the Egg nebula. The pictures revealed just what was expected: remnants of stars in the early stages of death, surrounded by spherical clouds of gas slowly moving outward. Upon closer examination, however, researchers realized that the dust clouds surrounding these stars had distinct ripples, or shells, suggesting that the stars were shedding their layers in fits and starts. Had the ripples been spaced a year apart, or even 5,000 years apart, they would have fit the standard theories just fine. Those time spans coincide with known stellar behavior: once a year, for example, a red giant pulsates in brightness, an event astronomers think is linked to an episodic shedding of gas; likewise, every 5,000 years the helium in an outer layer of the star ignites and burns up in a flash, and the star undergoes a brief burst of expansion. The trouble is, the shells seen in the Hubble images are from 200 to 1,000 years apart, and astronomers know of no process that could conceivably cause a dying star to shoot off a layer of gas every 200 to 1,000 years. We’re at a loss at this point to explain what we’re seeing, says Bond. One possible explanation, says Raghvendra Sahai, a researcher at the Jet Propulsion Laboratory in Pasadena, California, is that each ripple might in fact consist of several smaller ripples too tiny to be seen even with the Hubble. According to the mathematics of this theory, layers farther from the core should have more space between them than those up close, an effect that shows up in the Hubble’s image of the Egg nebula. Sahai is currently eager to test his hypothesis on other nebulas. If astronomers have been ruffled by the ripples, they have been completely blown away by the Hubble’s new images of so-called fliers, an acronym for fast, low-ionization emission regions. These are fast-moving knots of bright gas that seem to be shielded somehow from the harsh radiation of a nebula’s dying star. Bruce Balick of the University of Washington used to think that fliers were speeding chunks of stellar ash that had somehow been coughed up from deep within the core of a dying star and had broken through the surrounding layers of gas and dust. The Hubble image of ngc 6826 changed his mind. The fliers in this nebula, which appear as two red blobs against a pale green background of radiation, seem to be moving fast enough--about 100,000 miles per hour--to fit Balick’s original theory, but they also have backward-pointing bow shocks, as though an even faster wind were coming from behind and pushing past them. This suggests that the fliers were not produced in the star’s death agony after all but instead date from some earlier time, before the birth of the high-speed winds. No one at this point can say exactly what the fliers are, but Balick speculates that they may in fact be dense, almost stationary knots of gas. Each may be bigger than our solar system and have the mass of Jupiter, and they may sit still in the middle of high-speed jets that blow gas and dust off their surfaces like sugar off a doughnut. No image was more eagerly anticipated than the Hubble’s shot of the Helix nebula. In particular, astronomers were hoping for clues as to what forces might have shaped the Helix’s ragged edge, which looks like a series of arrows pointing back to the dying star at the center. These arrows, or cometary knots, says Rice University astronomer Robert O’Dell, are actually huge pockets of gas and dust, each bigger than our solar system. Although the Hubble’s shot of the ragged edge reveals spectacular detail, it suggests no ironclad explanation for what creates the knots or how they retain their shape in the face of fast winds streaming off the nebula’s hot, exposed core. Astronomers had also hoped that the Hubble images would uncover companion stars thought to be responsible for some of the more bizarre shapes of planetary nebulas. According to this theory, when the dying star swells to become a red giant, it engulfs the companion star. The red giant’s atmosphere slows the companion star down, and it begins to fall inward. Over time the companion star spirals into its dying partner, trailing clouds of gas along with it and forming a thick disk along the plane of its orbit. As this happens, the dying star’s wind pushes out from the center against the disk, shaping it into a bright, dense, expanding ring. (This structure can be seen clearly in the image of the Ring nebula.) Sometimes the wind also blows some of the cloud into large hourglass-shaped structures. The Hubble captured such an image, from a perspective slightly above and off to the side, of the Etched Hourglass nebula. Although astronomers do not see a companion in the Hourglass nebula, they believe that one sits too close to its core for the Hubble to detect, and that it is responsible for pulling the core off center. Astronomers have scrutinized about 100 nebulas for signs of a small, faint companion amid the glare of the bright core, but so far, in some five out of six cases they’ve come up empty. This may be because the companions are too close to the dying stars for the Hubble to detect. It may also be because the nebula-shaping companions are not even stars per se. Some astronomers think that very large planets, such as Jupiter, may have enough gravity to deform the gaseous disks into the shapes we now see. If so, then perhaps even our own companionless, middling sun may ultimately escape a dull death. Someday, when it goes, it may produce a gloriously misshapen nebula to mark its passing.